Jake Dennis battled back from a tough qualifying result to vault his #3 Team WRT Audi R8 LMS machine to 12th position in the final qualifying race of the Blancpain GT Series Sprint Cup season at the Nürburing in Germany. Racing Steps Foundation-backed driver Dennis and team-mate Pieter Schothorst, who was caught out by two red flags in the day’s earlier qualifying session, were forced to start from 21st position on the grid for the opening one-hour sprint. 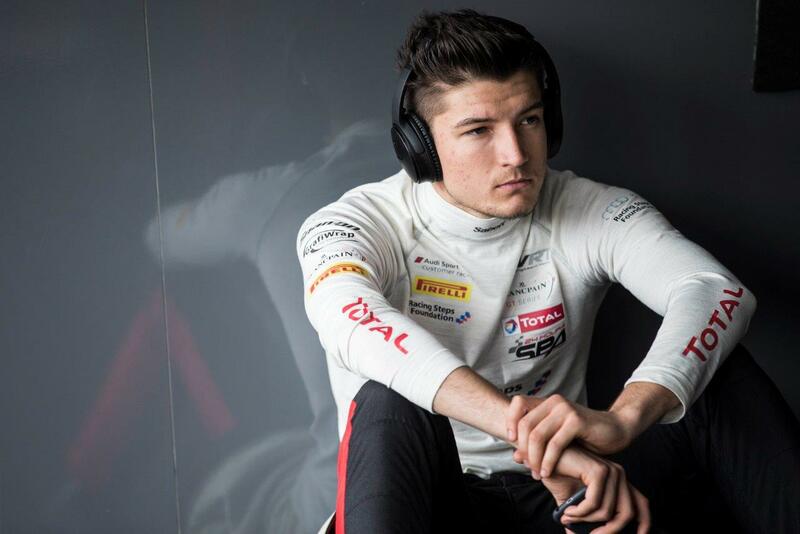 Fellow RSF-backed Ben Barnicoat, who had comparatively qualified well in 10th position in his and team-mate Côme Ledogar’s #58 Strakka Racing McLaren 650S GT3, were to suffer from a dramatic opening lap. As Barnicoat and Schothorst began the race in their respective machinery, Barnicoat attempted to keep out of trouble by maintaining on the outside line as surrounding cars made contact. Having gone wide to escape trouble at Turn 1, Barnicoat tussled with the #27 Team Lazarus Lamborghini Huracan GT3. Having moved ahead, the McLaren headed towards the turn eight Dunlop Hairpin. Barnicoat again kept to the outside line as the field bunched up to the inside. However on this occasion, it would work against the British driver. As cars entered the apex of the corner, the #75 ISR Audi R8 LMS of Franck Stippler was tipped into a spin and the Audi subsequently rolled backwards towards the outside of the track, directly into the path of Barnicoat who attempted to take evasive measures. The pair collided, heading into the gravel and to retirement. The incident prompted a safety car, with Schothorst stuck in 25th position and upon the resumption of the race, the Dutch driver struggled to make inroads. He therefore pitted immediately when the pit window opened with 35 minutes remaining. The speed and effectiveness of the WRT squad enabled Dennis, who stepped into the #3 Audi, to re-join the track in 17th position. Dennis quickly made his way through the field, including past the #1 WRT Audi of Enzo Ide. Once past the Belgian racer, Dennis sprinted away as he sliced into the advantage held by the #7 Bentley Continental GT3. As both the Bentley and Audi made their way past the #90 Akka ASP of Michael Meadows who struggled to manage the life of his tyres in the closing stages of the race, Dennis moved into 12th position but sadly wasn’t able to make up any further places before the chequered flag. The #84 Team HTP Mercedes-AMG GT3 of Franck Perera and Maxi Buhk scored victory after the #19 Grasser Racing Lamborghini Huracan of Exequial Perez Companc and Andrea Caldarelli was handed a one-second time penalty as a result of Companc cutting a corner. The pole sitting #5 Team WRT Audi R8 LMS of Marcel Fässler and Dries Vanthoor scored third place.